Don’t worry, we’ve found 11 of the best apps for learning Spanish well, and for having fun while you’re at it. In fact, you’ll feel just like you’re playing a game on your smartphone. FluentU is one of the most unique apps among this list. 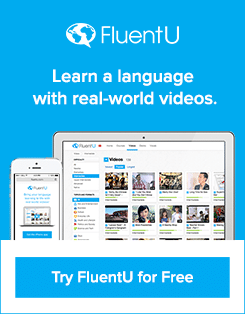 FluentU takes real-world videos like music videos, commercials, news, and inspiring talks and turns them into language learning experiences. 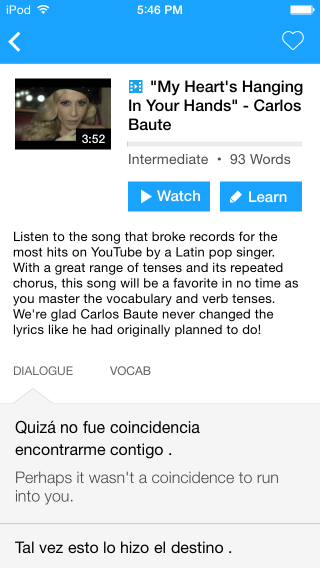 In contrast to other apps that take a scripted approach, FluentU uses a natural approach that helps you ease into the Spanish language and culture over time. You’ll learn Spanish as it’s spoken in real life. 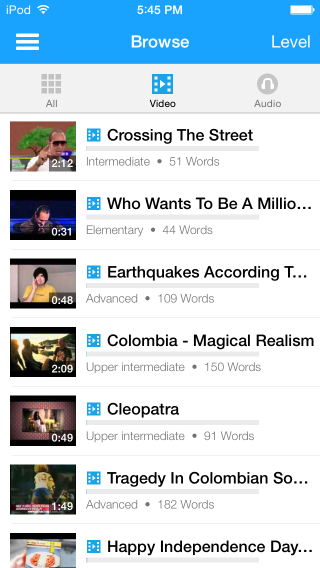 Native language videos are within reach with interactive transcripts. You can tap on any word to look it up instantly. Every definition has examples that have been written to help you understand how the word is used. If you see an interesting word you don’t know, you can also add this to a vocab list to reference later on. FluentU is highly recommended for people who are audio-visual learners and want to learn more about the Spanish culture. 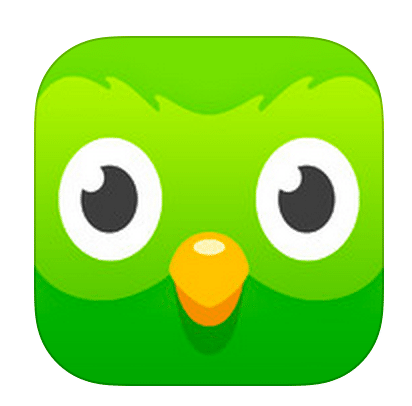 Among all the apps here, Duolingo probably has the highest ratings of all – it won the Best App Award in 2013 in both the AppStore and the Google Play Store. Duolingo Spanish is split up into units that have a certain theme (e.g. education, work, medicine), and it’s designed so that each unit goes up in difficulty. Units are generally divided into two types: tenses and others (e.g. nouns, adjectives, adverbs, question words, pronouns, etc.). It’s very unique in the fact that it’s not grammar intensive – as a matter of fact, apart from about 10 of the most commonly used tenses, you won’t see any grammar lessons throughout the app. Within each unit, there are sub-units. Each sub-unit covers about 7 – 10 words. Each unit can have anywhere from 1 – 10 sub-units. Inside each sub-unit, there are six types of exercises that teach you these words, building on what you already know: the voice recording, where you read a Spanish sentence out loud after hearing a native recording; English to Spanish translation of a phrase; Spanish to English translation of a phrase; matching a photo to a word; rearranging words to form a sentence; and multiple choice questions. There are about 20 questions per sub-unit. If this sounds like a lot, think again. Duolingo was designed to be quick to use, so it uses a very focused approach to distill lessons down to the bare essentials. What that means is if you can commit about 20 minutes of time every day to go through 3 – 4 lessons, you’ll be able to finish all the lessons in about 3 – 4 months time (taking into account word loss over time). There are also some really cool additional features as well – like following friends, setting a daily “track” to measure progress, word loss meter, Duolingo’s virtual currency (lingots) store, etc. Overall, Duolingo really manages to teach Spanish in a simple way by honing in on the 1500 most important words that are most commonly used in daily situations. Among the 11 apps here, Rosetta Stone is undoubtedly the most famous learning methodology and sits as the oldest language learning app. 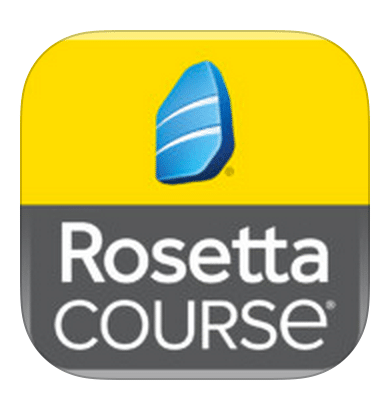 Rosetta Stone is designed very differently than most language apps that are on the marketplace today. Instead of learning Spanish through English, it is designed for us to learn Spanish through Spanish. In other words, it’s trying to teach us Spanish the way we’d learn it if we were children starting to learn the language. Within the platform, you’ll see that all words, phrases and audios are in Spanish – you’ll literally be getting zero translations to English. It’s that immersive of an experience! On top of its learning component, it also has a platform where you can schedule lessons with a live tutor every other lesson. So if you enjoy practicing Spanish by talking to native speakers, this might be a great bonus feature. Overall, I have to say that this is a pretty intensive method. But if you’re a language enthusiast (and a purist at that), then this might just be what you’re looking for. See more information on the official site here! 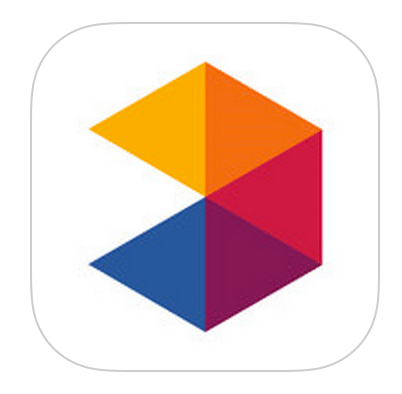 Among these apps, MindSnacks is probably an app that’s most suitable for Spanish learners studying Spanish in school. 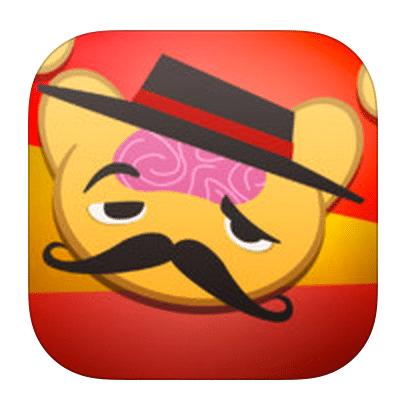 MindSnacks is often a widely praised iOS Spanish app that treats learning Spanish as a game rather than being taught entire phrases and grammar points. When you first enter the app, you’re taken to the homepage with nine games, and each game is based on content that’s centered on a certain theme, like food, home or school. For example, there’s a game called Swell. In Swell, an English or Spanish word flashes on screen. Two choices are then given for the Spanish and English equivalents. Before the time runs out, you have to select the correct answer. If you select the wrong answer, you’ll lose your streak. And it gets faster and faster every word, so you have to know your words really well to select the right answer quickly! Eight other games are also available for all vocabulary sets. One thing I’ll comment about MindSnacks is that the graphics are tailored for young children. If you don’t mind this, then it can still be a fun way to learn Spanish, and an effective one too. Memrise is a very unique language learning app. 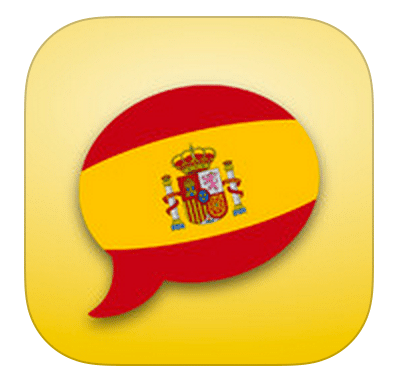 Unlike other apps, its sole purpose is to help you memorize Spanish words, hence the name “Memrise”. 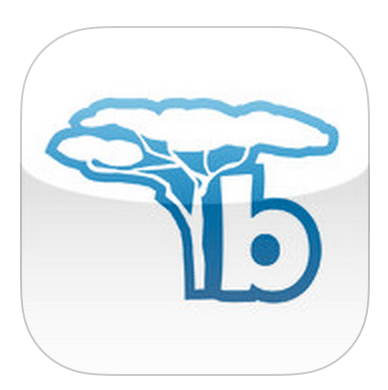 And in my opinion, it’s also one of the most creative iOS Spanish apps for learning Spanish words around. There are different modules in the app, and many more lessons in each module. For example, for Spanish, there’s “Learn Basic Mexican Spanish,” “Advanced Spanish,” “Spanish Vocab by frequency” (4650 words), and “250 most commonly used Spanish words”. One lesson in each module typically helps you learn 15 words. For each lesson, it generally consists of a Spanish word, its English meaning and an audio recording. In similar examples, you get ridiculously funny sentences that contain both the Spanish word and its meaning. And because it’s usually hilarious (sometimes it comes with a picture too), it’s that much more memorable than had you stared at the word on a piece of paper. This is a really creative way to learn words in a foreign language, with some pretty slick humor too. Memrise is highly recommended for all who find it tedious to memorize new words. 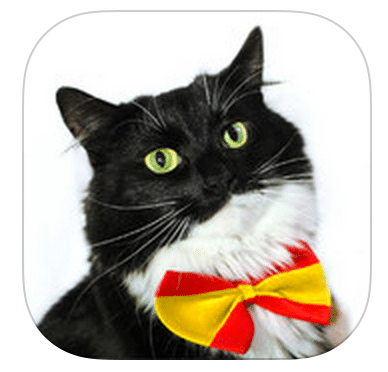 As an iOS app to learn Spanish, Cat Spanish is also one of the most unique apps out there. A spin-off project by the same creators of Memrise, Cat Spanish is a Spanish app with a humorous slant: all the pictures, features and design are themed around cats! Inside the app, you’ll move along a track to complete challenges, which are oriented around commonly used Spanish phrases. Generally, there are lessons that show a (cat-themed) picture, along with a Spanish phrase and its English translation. After familiarising yourself with phrases, you’re give multiple choice quizzes to see how much you remember. What’s really unique about the Cat Spanish app is that the cat photos aren’t just random cat pictures taken from the web, they’re actually relevant to the Spanish phrase you’re learning. For example, if you’re learning how to say “please” in Spanish, “por favor,” you’ll see a cat standing up with his hands held together, eyes looking up, like a human saying please. In addition, there are brief grammar lessons in between to let you understand the grammar component of the Spanish phrase you just learned. For example, after learning “tengo miedo” (I’m afraid), it’ll explain that instead of saying I am afraid, in Spanish we say, “I have fear”. Another great feature about the Cat Spanish app is that you can add friends to the game. So as you progress along the track and complete challenges, you’ll see how you’re doing compared to your friends. Overall, if you’re a cat lover, seeing cats on almost every screen can make learning Spanish just that much more fun! 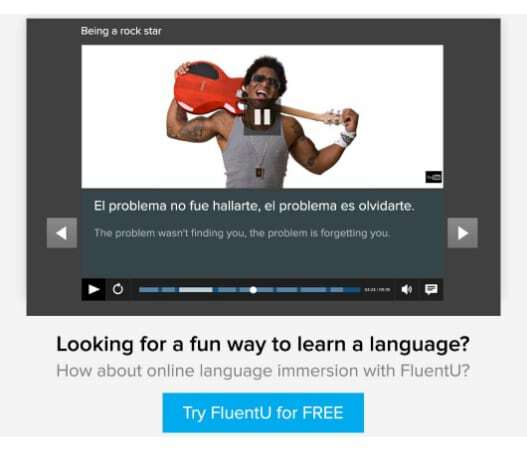 Fluencia is an online based platform that teaches Spanish through a highly visual method. So instead of a lot of text, there are a lot of visual aids to guide the learning process. There are five levels for Fluencia, with 10 units per level. After going through all the lessons, it reckons that you’ll be on par with someone who studied Spanish in college for a year. Not bad for 50 units of lessons, eh? Within each unit, there are various types of lessons covering a conversation, vocabulary, grammar, culture and communication. It’s really a mix on how the lessons are presented. At times, there are conversations you can hear and follow along, there are also places where you have to type the translation of an English phrase, and there are places where you match the picture with the correct Spanish phrase. The platform itself is very intuitive and easy to use. There are also lots of pictures and visual aids cleverly weaved into each lesson. One thing I thought was interesting is that Fluencia actually customizes its lessons. For instance, after every unit you complete, there’s a review session. That review session is based only on words you’re weaker at, so it’s helpful for remembering tricky words in Spanish. And because Fluencia is online (instead of developed as an app), this Spanish app provides a great user experience for both iOS and Android devices. 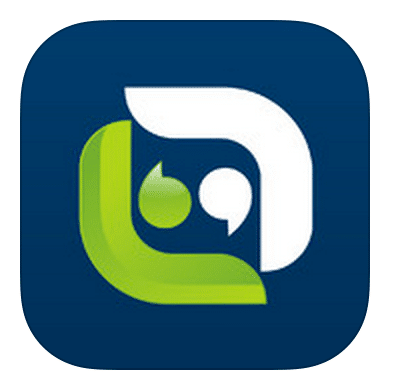 To me, Open Language has a really professional feel to the platform that sets it apart from many of the other apps. 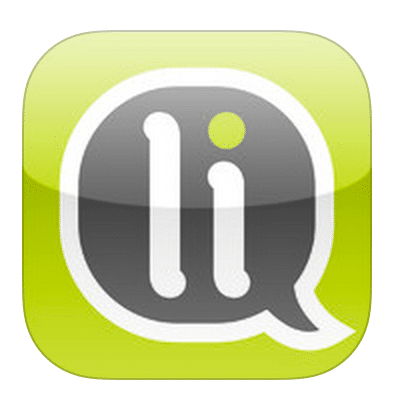 Among language learning apps that have a more “serious” feel, it’s probably one of the best Spanish apps for Android and iOS alike. Open Language Spanish is broken up into many courses. Here, you also see where the professional feel comes from – Open Language Spanish courses actually correspond to the 6 levels of the CEFR. So instead of promising to teach Spanish, it promises an equivalent proficiency from A1 – C2 of the CEFR, which is very useful for benchmarking your progress against an internationally accepted scale. Each lesson is centered around a dialogue between two hosts. The two hosts repeat the Spanish dialogue several times, and interject English comments here and there to explain new Spanish terms. After you listen to the audio recording, you can see the dialog transcript below, a summary of the vocabulary you cover, an expansion section for additional words and phrases, a grammar section covering one to two grammar points, and exercises to strengthen what you learned. Overall, if you’re a serious Spanish student, or someone looking for a course that’s based around an accredited standard, Open Language Spanish may be something to check out. 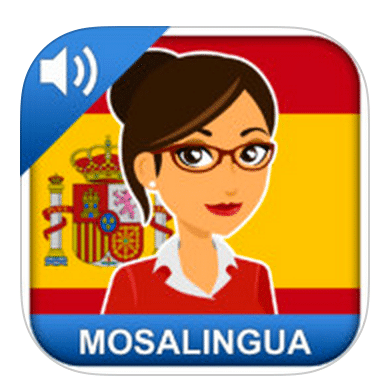 MosaLingua is a platform that is designed to teach Spanish using several efficient methodologies, such as SRS (which helps calculate review dates based on how difficult you find words as you learn them), focusing on 20% of the most important vocabulary, as well as ingraining words into long term memory. I found the fact that it focuses on 3,000 most common words and phrases to be attractive – after all, the golden ratio really holds in many situations; you really only need about 20% of the language to get through 80% of daily situations. As with most language learning apps, there are distinct sub-categories of words and phrases, so it’s very well organized. Also, you’ll find that for all Spanish words and phrases, there are native speaker recordings, so you won’t go astray in pronunciation. With both the iOS Spanish app and the Android Spanish app receiving largely positive user ratings, this is an app you don’t want to miss. In a nutshell, Busuu is an online Spanish learning platform, and like Open Languages Spanish, it divides up levels according to the CEFR. Inside each lesson, it takes you through the lesson material in a well paced sequence. In other words, you’ll be covered in all four areas of language learning (reading, writing, speaking, listening) – but I feel like this is a platform best used to learn spoken Spanish. One really cool feature is that you can do a mock conversation. At the end of a lesson, you’ll be taken to a dialog with two people. One person’s part is already recorded, and then you have to record your part. At the end of it, the app combines all the parts together and plays the conversation as a whole, which I think is pretty neat. Among all apps listed here, Busuu is probably the best iOS and Android Spanish app that draws heavily on the strength of its community. Highly worth checking out if you like connecting to people. Similar to Busuu, Lingualia is a complete platform that takes you through Spanish lessons in a well designed sequence based on your level. Lingualia offers units that range from the A1 – B2 levels of the CEFR, and there are about 50 units per level, so there’s quite some material to comb through. Each unit is based around a theme, very much like how we learn Spanish as a foreign language in school. Each lesson has a few components to it: the dialog, vocabulary concepts, grammar points, similar words and checkpoint exercises. The dialog is where it all begins, really. You’ll hear these audios spoken out loud, which are all recorded by native speakers, so the conversations flow naturally. 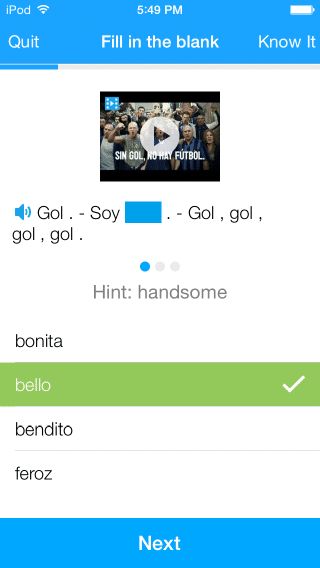 After seeing the dialog (presented in Spanish), you’ll go through vocabulary. This is where new words and some colloquial phrases are introduced as key words to learn for the lesson. Of course, as with a traditionally presented course, the lesson doesn’t end without a bit of grammar. The grammar topics are highly relevant to the level you’re at, which can be concepts like indirect pronouns and the preterite tense for beginner levels, and the imperfect preterite tense for advanced levels. Before the review of the lesson, there’s also an interesting section where two similar words are presented, and examples are given to show you how to distinguish between them. Outside the lesson, there are also several other features: the challenge section, where you can “fight” either with the computer or another user in a quiz-like test and an activities section, where you can practice your Spanish writing. Overall, this is an app that really resembles learning Spanish in a traditional setting (without the homework assignments and the demanding teacher! 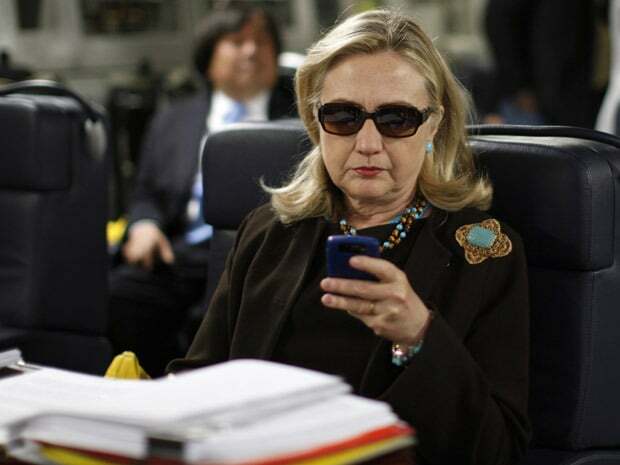 ), and a comprehensive app at that. If you’re looking for something more practical to take with you on the go, Speak Easy might be something for you. A true mobile app available only for mobile platforms, Speak Easy is essentially a travel friendly phrasebook to take with you. Most phrasebooks you’ve bought probably had something like “ke as dee-cho” as a pronunciation aid for “Qué has dicho?”. But Speak Easy actually offers native recordings for most phrases and words, so you’ll be able to copy these native recordings easily. Another cool feature it has is the slow playback feature – if you hear a phrase and it’s too fast, you can play it back at a slower speed to listen to it more carefully. 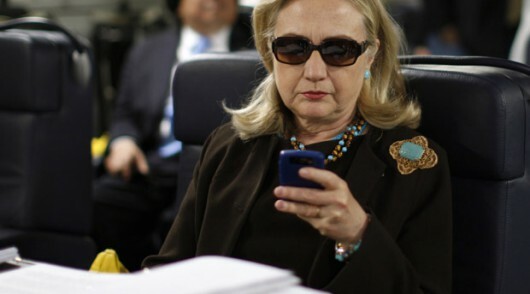 A recent update also included a new feature to the app – flashcards. So if you want to really learn Spanish, and not just for emergency travel use, it’s a great way to review learned phrases and words. As you can see, while all of these Spanish apps have many similarities, each one of them is designed with a slightly different purpose in mind. Some might be better at teaching words, some might be better at teaching grammar, while others might be great for practicing your speaking. So, depending on how you want to learn Spanish, you might choose a different app that best suits your purpose. The best of luck with learning Spanish!